A set of bar fraction charts when learning about one whole, 1/2, 1/3, 1/4, 1/5, 1/6, 1/8. Ideal to use in the numeracy classroom when learning about fractions (one whole, 1/2, 1/3, 1/4, 1/5, 1/6, 1/8). 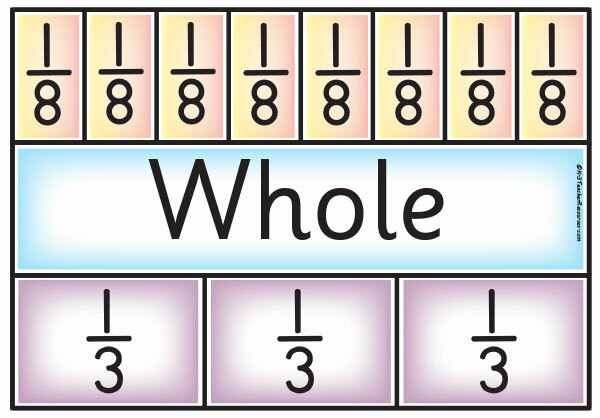 Children can refer to the charts when completing fraction activities or use the charts as a fractions puzzle. Print and laminate each bar fraction chart. Display the charts on your numeracy wall and refer to the charts when teaching fractions. What comes next? – Print, cut and laminate a class set for children to match up and put together.